A SpaceX Dragon capsule departs the International Space Station on Jan. 13, 2018 to return 4,100 lbs. (1,860 kilograms) of science gear to Earth and end a monthlong delivery mission. 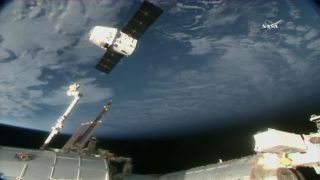 A SpaceX Dragon cargo ship left the International Space Station and returned to Earth Saturday (Jan. 13), wrapping up a nearly month-long delivery mission for NASA that also marked the spacecraft's second trip to space. "Good splashdown of Dragon confirmed, completing the second resupply mission to and from the @Space_Station with a flight-proven commercial spacecraft," SpaceX representatives said in a Twitter update. Dragon is carrying nearly 4,100 lbs. (1,860 kilograms) of cargo to Earth, much of it science gear from human and animal research, and other experiments. That gear includes hardware from an experiment by space manufacturing company Made In Space to 3d-print ZBLAN glass fiber optic wire in space, and a group of live mice from NASA's Rodent Research 6 study to develop medications that address muscle loss in space., NASA officials said. A SpaceX Falcon 9 rocket launched the Dragon mission on Dec. 15, with the capsule arriving at the International Space Station on Dec. 17. The mission, SpaceX's 13th resupply flight for NASA, delivered 4,800 lbs. (2,177 kilograms) of supplies and gear for astronauts. In addition to delivering cargo, the mission marked a milestone for SpaceX's rocket reusability program. Both the Dragon capsule and its Falcon 9 booster made their second trips to space on this flight. The Falcon 9 booster's first stage previously launched a different Dragon capsule to the space station in June 2017. The Dragon capsule on this flight, meanwhile, previously visited the space station in April 2015. Editor's note: This story was updated at 10:49 a.m. EST to include the successful splashdown of the Dragon capsule.